ALVA, Okla. – J.D. Struxness transferred to Northwestern Oklahoma State University earlier this fall in order to better learn the art of steer wrestling. That theory is working quite well. 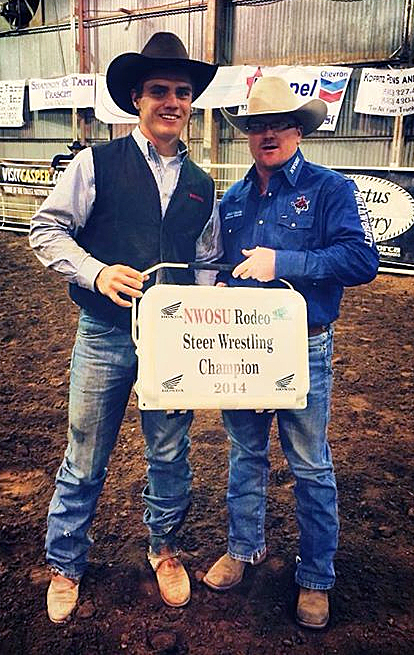 This past weekend, Struxness won both rounds and the steer wrestling average at the NWOSU rodeo. Struxness is from Milan, Minn., and attended his first year on the rodeo team at Missouri Valley College. Because of National Intercollegiate Rodeo Association transfer rules, he had to sit out for the first three events of the Central Plains Region season. The victory in Alva was a good way to start his Northwestern career. “I drew good steers all weekend,” said Struxness, a sophomore who posted a 4.1-second run to win the opening round, then followed it with a 3.5 to win the short-round and the average. He was one of eight Northwestern men in the championship round, where he was joined by steer wrestlers Brock White and Grayson Allred; tie-down ropers Hayden Pearce and Maverick Harper; the team roping tandem of Pearce and Wade Perry and header Dalton Richards; and bull rider Weston Wilson. White, who posted a two-run cumulative time of 9.0 seconds, placed second in the short round and average. Pearce and Perry finished fourth in the team roping average, while Wilson finished sixth in bull riding. Overall, the men’s team finished second. It was a solid performance at the Rangers’ hometown rodeo. The women’s team, which finished third this past weekend, was paced by senior Karley Kile of Topeka, Kan. She won the breakaway roping championship – she finished third in the opening round with a 2.4-second run, then scored a 2.5 to win the short round and the average – and shared the first-round victory in goat tying with a 7.0-second run to earn a place in the short round. Breakaway roper Taige Trent placed in both rounds and finished second in the average. She and Kyle were joined in the short round by goat-tier Elli Price, who finished fifth in the average. The Northwestern rodeo was the final of four Central Plains rodeos in the fall portion of the season. The remaining six events will take place during the spring semester. The Rangers women finish the fall semester first in the regional standings; the men are fourth.